ນັກ​ລອຍ​ນ້ຳ​ອະ​ວຸ​ໂສ​ຂອງ​ສະຫະລັດ ທ້າວ Micheal Phelps ​ແລະ​ດາວ​ຮຸ່ງ​ດວງ​ໃໝ່ນາງ Katie Ledecky ຫວັງວ່າຈະສືບ​ຕໍ່​ຄອບ​ງຳ​ການ​ແຂ່ງຂັນ​ລອຍ​ນ້ຳຂອງ​ພວກ​ເຂົາ​ເຈົ້າ​ແລະ ຈະ​ມ້ວນທ້າຍ ການ​ແຂ່ງຂັນໂອ​ລິ​ມປິກ ໃນ​ພາກ​ສ່ວນຂອງ​ພວກ​ເຂົາ​ເຈົ້າ​ ດ້ວຍຄວາມເຂັ້ມ ແຂງໃນ​ວັນ​ສຸກ​ມື້ນີ້. ທ້າວ Phelps ທີ່​ຫາ​ກໍ​ໄດ້​ຮັບ​ຫລຽນ​ຄຳມາ​ໃໝ່ໆ​ຈາກ​ການ​ລອຍ​ນ້ຳທ່າ​ປະສົມຫຼື medley 200 ​ແມັດ ​ໃນ​ວັນ​ພະຫັດ​ວານ​ນີ້ ຈະ​ລົງ​ແຂ່ງຂັນລອຍ​ນ້ຳໃນທ່າ​ແມງກະ​ເບື້ອຫຼື butterfly ​ໄລຍະ 100 ​ແມັດ​ໃນ​ຂະນະ​ທີ່​ນາງ Ledecky ຈະ​ມ້ວນທ້າຍ​ຄ່ຳ​ຄືນ​ດ້ວຍ​ການ​ແຂ່ງ​ລອຍ​ນ້ຳແບບ Freestyle ໄລຍະ 800 ​ແມັດ. ຖ້າຫາກ​ຊະນະການ​ແຂ່ງຂັນ​ນີ້ ນາງ Ledecky ກໍ​ຈະ​ເປັນຜູ້​ຊະນະ​ການ​ແຂ່ງ​ລອຍ​ນ້ຳ​ແບບ Freestyle ທັງໄລຍະ 200, 400 ​ແລະ 800 ​ແມັດ ຢູ່ທີ່ການແຂ່ງຂັນ​ກິລາໂອ​ລິ​ມປິກ​ທີ່​ນະ ຄອນຣິ​ໂອ. ສ່ວນ​ການ​ໄດ້​ຮັບ​ໄຊຊະນະ​ຂອງ​ທ້າວ Phelps ນັ້ນ ຈະ​ເຮັດ​ໃຫ້​ຜູ້ກ່ຽວ​ໄດ້​ຄອບ​ຄອງ​ຫລຽນ​ຄຳ​ອັນ​ທີ 5 ຢູ່​ທີ່​ນະຄອນຣີ​ໂອ ​ແລະ​ເປັນຫຼຽນ​ຄຳ​ອັນ​ທີ 23 ຂອງ​ຜູ້ກ່ຽວໃນ​ການ ແຂ່ງຂັນ​ກິລາ​ໂອ​ລິ​ມປິກ​ທັງ​ໝົດ. ການ​ມອບ​ຫລຽນ​ໃນ​ການ​ແຂ່ງຂັນ​ກິລາ​ແລ່ນ​ແລະ​ລານ​ອັນ​ທຳ​ອິດ​ຂອງ​ປີ 2016​ ຈະ​ມີ​ຂຶ້ນ​ໃນ​ຕອນ​ເຊົ້າມື້ນີ້ເວລາ​ພວກ​ນັກ​ກິລາ​ແມ່​ຍິງລົງ​ແຂ່ງຂັນ​ໃນ​ການ​ແລ່ນ 10,000 ​ແມັດ. ​ໃນ​ຕອນ​ບ່າຍ ການ​ແຂ່ງຂັນ​ຍ່າງ​ 20 ກິ​ໂລ​ແມັດ​ ປະ​ເພດ​ຊາຍ ຮອບ​ສຸດ​ທ້າຍ ກໍ​ຈະ​ມີ​ຂຶ້ນ ຕິດ ຕາມ​ດ້ວຍ​ການ​ແຂ່ງຂັນ​ແກວ່ງໝາກ​ບຸ່ນ​ເຫລັກ​ປະ​ເພດ​ຍິງ. ສ່ວນ​ການ​ແຂ່ງຂັນ​ເອົາ​ຫລຽນ​ອື່ນໆ​ນັ້ນ ​ແມ່ນ​ຮວມທັງ​ກິລາ​ພາຍ​ເຮືອ​ ທັງປະເພດ​ຍິງ​ແລະ ປະເພດຊາ​ຍ​ ການ​ຍິງ​ປືນ​ທັງ​ຍິງ​ແລະ​ຊາຍ ກິລາ​ມວຍ​ປະ​ເພດ​ຊາຍ ​ເທັນ​ນິສປະ​ເພດ​ຊາຍ ຕະຫລອດ​ທັງ​ຢູ​ໂດ ທັງ​ປະ​ເພດ​ຍິງ​ແລະ​ປະ​ເພດ​ຊາຍ ຮວມຢູ່​ດ້ວຍ. Team USA swimming veteran Michael Phelps and new-comer Katie Ledecky look to continue their dominance in the water Friday and close out the swim portion of the Olympics on top. Phelps, fresh off a gold medal performance in the 200 meter medley Thursday, competes in the 100 meter butterfly, while Ledecky will end the night in the 800 meter freestyle. Should she win, Ledecky will have swept the 200, 400 and 800 meter freestyle races in Rio. A win for Phelps would give him his fifth gold medal in Rio and his 23rd gold medal of his Olympic career. The first athletics (track and field) medals of the 2016 medals will be awarded, the first coming in the morning when the women compete in the 10,000 meter race. In the afternoon, the final in the men's 20km walk will take place, followed later in the night by the women's shot put final. Women's football (soccer) heads into the quarterfinals, with the U.S. taking on Sweden in the morning. Later, Germany and China will face off. Canada plays France in the afternoon and Brazil faces Australia in the evening. Other medal events include both men's and women's rowing, men's and women's shooting, men's boxing, men's tennis and both men's and women's judo, among others. In Thursday's competition, American gymnast Simone Biles officially became the best gymnast in the world. Biles won the women's individual all-around contest, while her equally talented teammate Aly Raisman took the silver medal. Russian Aliya Mustafina earned the bronze. 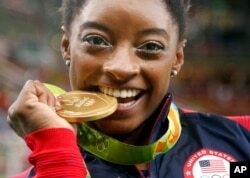 The 19-year-old Biles is now the fourth straight American woman to win the all-around title and fifth overall, while taking her place as the greatest gymnast of her generation and perhaps of all time. Phelps earned his 22nd career gold medal in the 200 meter individual medley. His wins gave him his fourth straight individual medley title at the Olympics. American swimmer Simone Manuel tied for gold in the 100 meter freestyle, sharing the title with Penelope Oleksiak of Canada, after both swimmers touched the wall at exactly 52.70 seconds. Manuel is the first African American to earn a swimming medal. China continued its dominance in table tennis as Ma Long, the best player in the world, beat his teammate, Zhang Zike in the championship. The win marked the third straight time the Chinese team has won both gold and silver at the Olympics. American Kayla Harrison successfully defended her Olympic judo title in the women's 78-kilogram division, beating France's Audrey Tcheumeo in a tense final. With just six seconds left, Harrison caught Tcheumeo's arm in an armlock and forced Tcheumeo to tap out in submission, automatically winning the contest. The Fiji men's rugby team won the country's first-ever gold medal after handily defeating Britain in the championship rugby sevens match 43-7. Rio marks the first time rugby has been played at the Olympics since 1924. Britain won the first gold medal of the track cycling program at the Rio Olympics, rallying past New Zealand in the final of the men's team sprint by the slimmest of margins.